The Billing & Cost Management Dashboard gives you a quick, high-level view how much you are spending in your account. 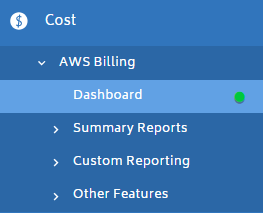 To access the dashboard, go to the left navigation pane, and choose Cost > AWS Billing > Dashboard. The first thing you can do is see how much you have spent. We show you last month, the current month-to-date, and a forecast for how the month will end. You can also see a breakdown of your spend by Service, with a handy pie chart to visualize. After the dashboard, you can get even more in-depth information for your costs by diving into the Single Month Summary report.